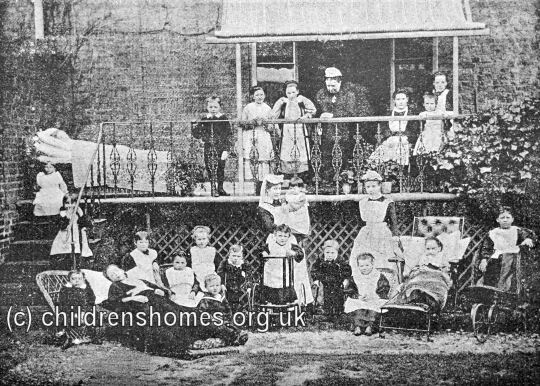 The St Nicholas' Home for Crippled Children was established by the Waifs and Strays Society in 1887 at Talgarth House, 89 Trinity Road, Upper Tooting, Surrey. Its opening resulted from the Society's campaign, linked to Queen Victoria's golden jubilee celebrations, to provide care for children with physical disabilities. The home, which was officially opened on February 22nd, 1887, could accommodate 20 girls and small boys, aged from 3 to 12 years. The Trinity Road premises, only ever envisaged as temporary, were vacated in 1893 when the home moved to a larger and more suitable property at West Byfleet. The Trinity Road building no longer exists.